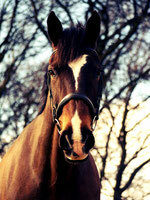 ILPH Islay (Ali), a 17.3hh, dark brown TB x Cob gelding, born in 1995. He is a retired Strathclyde police horse. He has been on loan from World Horse Welfare to Liz Mackay since 2002 and is the 3rd WHW horse she has retrained for vaulting. He has been vaulting internationally since 2006 and has competed all over Europe and was selected to represent Team GBR for four consecutive years in Championships. In 2014 he represented Canada at the World Equestrian Games in France. In 2017, he represented Great Britain at the Junior World Championships and the Senior European Championships which took place in Austria. He has also appeared on stage in front of Simon Cowell and the other judges at Britains Got Talent. 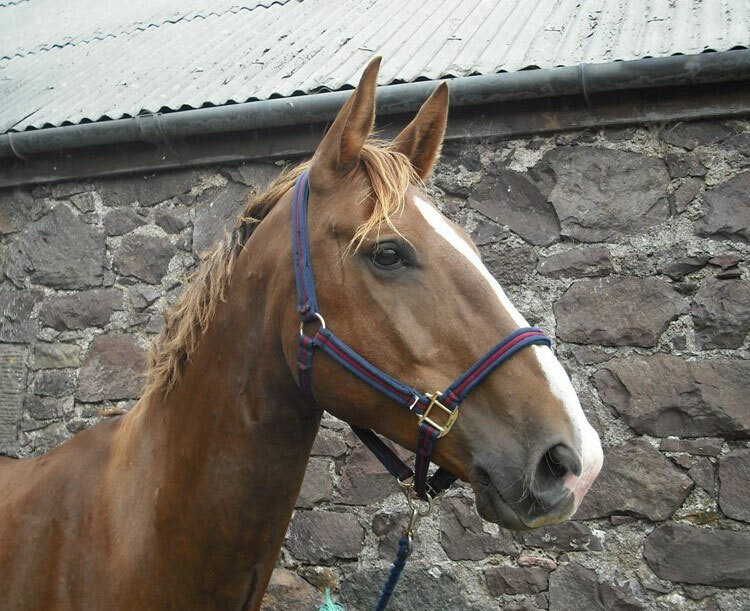 Dazzling Edition (Darcy) is a 16.1hh, TB X ID dark bay gelding, who was born in 1999. He arrived in 2010 and took to vaulting very quickly, loving the children and all the attention. He works with all level vaulters both individuals and squad. Darcy is also very good at teaching people to ride being both trustworthy and obedient. Toby is a 14.2hh, dark brown Welsh Cob x gelding, born in 2004. He arrived in August 2015. Toby is a perfect child's pony and has taken to vaulting very quickly, although he sometimes thinks he knows more than the coaches. He is always very keen to please and is schooled by Bryony Pettinger who competes him very successfully in showing, dressage and small jumping classes. Ulisco de Montsec (Talisker) is a 16.2hh, bright bay Selle Français gelding, born in 2008. He was a chance find and came to Hillside in September 2017. He had very little muscle structure so was worked slowly and carefully under saddle and on the lunge to strengthen him. He was taken to watch Darcy in vaulting sessions and we found when he was finally introduced to vaulters he seemed to know exactly how to behave. He has become a truly amazing vaulting horse and is loved by parents and children because he has such a kind temperament. 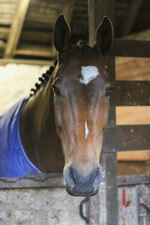 Caudillo Domino (Domino) is a 17.1hh, bright bay KWPN gelding, born in 2007, owned by Lesley Campbell. He arrived in October 2017. He is an ex-showjumper and took a few weeks to settle in but is now working well and being trained by Lesley. He likes being a vaulting horse and is making excellent progress. A star of the future perhaps. Rum n' Coke (Rambo), 17hh, skewbald gelding, born 2008. He had a kind temperament, great movement and enjoyed the challenges of advanced vaulting with Individuals and Pas de Deux. 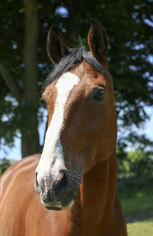 Bravour, 17.3hh, bay Belgium Warmblood gelding, born 2001. He had a big movement and a big heart and enjoyed the company of people. Brav was rehomed with Dr Charles Turner, father of vaulter Molly. Sadly he suffered a tragic freak accident in the field and had to be euthanised. He lived the life of a king in his short time with the Turners. Robbie, a 16.1hh, bay gelding, born in 1999. He was trained as a vaulting horse by Equibuddy and bought by Liz Mackay to assist with the Active Schools Programme in 2008. He also competed internationally. Robbie was a much loved and patient, but cheeky, member of the team. He meant so much to so many and was the very heart of kinross vaulting group. He died peacefully at home after a field injury and with old age related difficulties. RIP Robbie. You will be forever in our hearts. Big Ben (Ben), a 17hh Shire xTB bay gelding, born 2001. Ben is now enjoying a career change at Easterton Equine Activities, successfully competing and enjoying a varied life of dressage, showjumping, XC and showing with Kathryn Hunt. 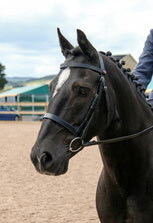 New Hills Indian Treasure (Indi), 17.3hh, dark bay ID X TB gelding born in 2000. After injuring himself while out in the field, Indi had to be euthanised in July 2014. His lovely temperament and cheeky personality will be greatly missed. Equus Maximus (Max) Liz Mackay owned Max a 17.2hh, chestnut, Hanoverian gelding from November 2007. He was a kind and gentle horse and he taught all in Kinross Vaulting Group a huge amount. We all miss him for many different reasons! Sadly Max colicked and despite an operation and intensive care, he colicked again five months later and had to be euthanised in 2012. RIP Max and Thank You. Blue, a 13.2hh Highland x, grey gelding who was on loan to the Club from Kaye Paterson. He is now working with RDA Dundee. Good luck Blue and Thank you!